I keep a tally of those things on a board near my garage door so that when I go in and out, I’ll glance at it. Some things have been marked off, but there are plenty of ones that are still there — just waiting, like an accusation — Hello, did you forget about me? Didn’t you want to do this? Why haven’t you?? I’ll blame it on my moods. When I have too many gray days in a row, I find myself drawing inward, settling into a ho-hum routine and avoiding that list. Maybe winter does that to a person. Maybe that’s what we’re supposed to do — slowdown, kind of hibernate, regroup and renew so that our minds can appreciate those experiences in the warm, light-filled days of one of my favorite seasons (the other being Fall). I begin getting that first spurt of doing, reorganizing, getting rid of the old so the new can come in. Things (work) have slowed down a bit for me as of late, so perhaps there’s a reason for that. Maybe it’s the universe prompting me, giving me a nudge: Hey, giving you a little breather here, why don’t you check off one of those things on your list? Be in a movie. I did this while living in Memphis. There was a casting call for a movie — remember the movie 21 Grams? It was a depressing movie, but I went for the casting call for extras, spent an entire day there, got paid a small amount, got free food and saw Sean Penn, Naomi Watts and a lot of other actors all of us have seen in movies that we can never remember their names. I was amazed at the amount of time one scene took. The scene I was in didn’t show up in the movie, but it was kind of cool anyway. Mountain climb, rappel, and float the Ocoee River. Did all of this within two weeks. (The Ocoee has Level 5 rapids, by the way). Be in play. This was a very small play in Knoxville. I went in, read for the part and got the lead female role. A large audience of 30 or so people showed up, but I did it. Get a degree, travel. Did this while working full-time and traveled (my job required this) to so many places that I’d read about as a child. Nantucket, Boston, New York, Los Angeles, Malibu, Chicago and so many others. My current list has several places to visit including Napa Valley, Quebec, Europe but nearby venues as well — the Catskills, Adirondacks, Sarasota Springs, an opera and/or symphony night in Manhattan and several famous restaurants and museums I’ve yet to see. FINISH MY BOOK. That one’s on there too, at the top. My list may seem a bit “tamer” than before, but no less exciting. My husband has added acting classes to my list which I keep meaning to do — there are a couple of those near me and can you imagine how that would benefit a writer? Plus, it’s fun and why the heck not? Why do we neglect those things that are so important to us that we’ve written them down? Does life and lack of funds get in the way? Or, is it that we let other things take priority? I don’t know about you, but the me from several years back never let any of those excuses get in the way. I found a way to do them. I opened myself up to allowing them to come into my life. It may have taken a while but when I set my mind to focus on those things, they happened, with time, they happened. So, in celebration of the coming season, I’m going to open myself up (like those little buds I’ve seen peeking out as a take a walk with my dogs) and allow those things to come into my life. 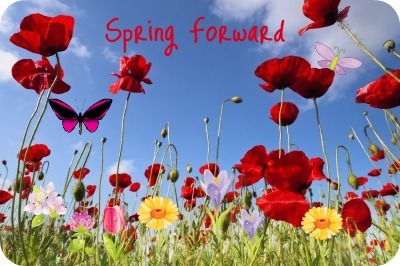 I may have taken more than a couple of steps back during the long, gray days but I’m ready to Spring Forward. It’s like jumping off a diving board — in that moment before you hit the water, flying down a bumpy trail on a mountain bike and feeling a rush before you reach the end, rappelling down a mountain or writing when you get an enormous, creative burst — you don’t know what’s going to happen at the end, but wow, it’s exciting and scary getting there. In the immortal words of John Lennon, Life is what happens to you while you’re busy making other plans. I’ve made my “plans;” now I just have to experience them. But first, I’m going to finish Feng Shui’ing my closets. :). Hi Carly, Thanks so much for your kind words — if I’ve inspired you, then that’s wonderful! See you soon…. :). Ha! Money like everything else flows in, flows out….and thank you, this blasted book is something i WILL finish. :).